Looking for a unique haunted attraction this halloween season? Haunted Hills Estate is exactly what you’re looking for. Located in Uniontown, Pennsylvania, Haunted Hills has been testing eager haunt-goers’ skills and wits for 13 years with it’s Challenge Trail. If you are feeling brave enough, lead a group of friends through the hour-long trail, dodging monsters at every turn, engaging in tests of dexterity, quick-thinking, and problem-solving. While working to undo an ages-old witch’s curse, your group will engage in six different trials, success rewarding you with fragments of a secret spell needed to expel the coven’s evil forever. This is a haunted experience unlike anything else that you will encounter – a truly interactive challenge. Also available at the Estate this year are Twisted Nightmare, a mini-Escape room, and Legends Hotel – a journey through the most dangerous lodging in the world. All three attractions feature entirely-new content and are better than ever. When it rains, it pours, so they say. Ok, first things first: the “guts” actors – the standard haunters, were passable to good. Legends doesn’t boast as thick an actor density as one may expect, but nearly every ravenous serial killer is afforded the opportunity to extend their interactions. There are very few “boo and done” moments at Legends; most haunted assailants engage your party over a much longer duration, preferring extended, dialogue-heavy encounters. Twisted Nightmare and the Challenge Trail include a few of these rank-and-file monstrosities as well, with the Pig-masked maniac in Twisted Nightmare being most memorable. In all, the quantity of the basic scarers throughout the attractions was certainly adequate. However, it is much more important to discuss a much more memorable aspect of the Estate, a quotient that really set it apart this year – it’s principle actors. By this, I refer to the key-note speakers, the truly interactive personas who venture beyond three-line scripts. Such characters ABOUND at HHE, and I’ll tell you what… they’re great. At times, an excursion through the estate felt more akin to audience-adapted theater. See Customer Service, below, for a thorough review of the wonderful gate keeper actors, but they weren’t the only impressive characters. In Legends, we enjoyed our interactions with creative baker, Miss Lovit, and the macabre charm of Dahmer. In the escape room, Tick Tock (not to be confused with the actress of the same moniker from last season), the clown, and Schizo kept us on our toes… bubbles! Most of the witches from the Challenge Trail were great as well, especially Lady Karma, Orpheus (who we feel a special bond with), the witch hunter, and my girl, Toaderella – my native cat language translated surprisingly well into her froggy vernacular. I attempted to remain diplomatic as we croaked and mewed our way through Bertrand Russell’s nihilistic doctrine, but I feel that we eventually reached common ground somewhere in the vicinity of Sartre. She gets me. Honestly, talking to, being belittled by, and exchanging quips with this lot absolutely made the haunt for us. As I address in Fright Effect, HHE is not an overtly-terrifying haunted attraction; it doesn’t try to be. But, the cast that they have available this year is wonderful, and elevates the attraction beyond a by-the-numbers spookhouse, into something that’s just pure fun. We noted a distinct improvement in costuming during our journey. As usual, the focal-point characters were the best equipped; each task-giver along the trail appeared authentic and properly adorned. Of these, Orpheus was easily the most inspired. Twisted Nightmare was solid all around. Vivian’s ensemble was certainly the stand-out, but each dweller within was certainly adeptly outfitted. Perhaps Legends was the weakest of the three attractions, though if only due to the increased number of fashion candidates. Truthfully, we didn’t encounter any glaring outlyers, though. Most of the Legends Hotel’s occupants were (in)human, so, really, there wasn’t a huge demand for enhancement. Regardless, it was all respectably adequate and the main residents (Mrs. Lovit foremost among them) were a step-above and impressive in their own right. A bit of background information: last season, when we reviewed HHE, we encountered a VERY long wait in line(s) that didn’t reasonably match the amount of customers accessing the attractions. This was, admittedly, a huge concern, and impacted our enjoyment of the attractions themselves. We were open about this frustration in our review. Many haunted attractions employ line-scarers – costumed actors dedicated to entertaining bored crowds as they mull through waiting lines, with varying levels of success. On busier nights, perhaps, HHE may deploy some as well (as they did last season), but we did not encounter any during our visit. Instead, each attraction had an in-character gate-keeper – individuals tasked with reading haunt rules and controlling the flow of customers entering the attractions. To our complete surprise and delight, these actors were FANTASTIC. Acting independently, we found them charismatic, witty, and wildly amusing, but they frequently also operated in tandem, barking insults at one another across the Estate, creating an impromptu horror-themed comedy routine that was, truly, more entertaining than any pre-attraction frivolity we have previously encountered. Particularly, the barbs shared between Ducky and Vivian culled the greatest chuckles. The third keeper, Sandwich, was distracted with the lengthy introduction to his attraction most of the time, unfortunately. Overall, though, these three actors are, without question, the best line entertainment that we have seen, bar none. As for the other customer service qualifications: restrooms, a concession stand, a lit-up parking lot, bonfires, etc – all fine and dandy. Nothing to complain about. Oh, and the EVERY staff member we encountered was incredibly friendly and helpful. Special thank you to Jessica! Ok, now, returning to praising the… ugh. Fine, I’ll move on to the next category. Sheesh. 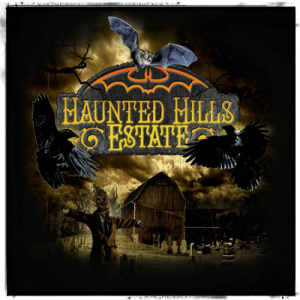 Three haunts in a triangular position, encircling a bonfire-laden hub area, occupying a dark, secluded farm in the middle of Absolutely Nowhere, Pennsylvania – that is the facade of Haunted Hills Estate. The greatest experience, though, comes as you begin descending the first hill towards the trail; dim lamp posts astride your path, you watch the frontage of your wooded destination begin to take form before you, and internally steel yourself to begin your quest. It’s definitely a great transitional bridge between the moderate bustling of the other two attractions and the forthcoming isolation of the Challenge Trail. Perhaps the other two attractions could benefit from a bit more haunt-specific ambience, but it’d be quite difficult to improve that solemn death-march toward the Trail. As a whole, HHE is very light on animatronics of any sort. With each attraction, for the most part, what you see is what you get: there are not extensive auditory, visual, or mechanical distractions or illusions. In this way, HHE’s aesthetics are decidedly old school. Fortunately, they have clearly begun further shifting to a more actor-customer, interaction-based experience and are all the better for it. Legends always has some fun twists and turns – hidden exits and unexpected surprises in the environment. The set design was ok – nothing too exquisite or under-developed. Again, the setting was largely a conduit for the actors, not intended to stand-out too much on it’s own. The escape room in Twisted Nightmare was well-constructed. There were just enough red herrings and miscellanea without becoming visually cumbersome or needlessly burdensome to sift through. The chosen location felt like… the chosen location – exactly as it should, and everything blended together authentically. The six namesakes of the Challenge Trail were mostly well done. Reducing their number, but making them group-efforts trimmed the fat somewhat, and made each feel more significant, more epic. In past years, there have usually been a handful of challenges along each trail that felt… arbitrary. This year, the smaller number and the all-inclusive nature of each made the successes feel legitimately exultant and our sole failure… devastating. The Wind Witch’s trial was certainly the weakest of the bunch, but, still, remained enjoyable. Again, the group-dynamic made this simple game still feel consequential. Legends took an interesting twist this year, featuring a new storyline that blended a variety of traditional horror tropes both real-life and fictional – imagine a serial killer Usual Suspects transplanted into the french film, Delicatessen; for the less cinematically-versed: “Soylent Green is People!” It was a fun premise and it worked pretty well. A few of the killers weren’t immediately recognizable, but most, at least, provide their bona fides in short order. Rest assured, you do meet the oft-referenced proprietor at the end – just ensure you don’t lose your head in the exchange. Twisted Nightmare took a few spoonfuls of carnEVIL-style haunting and mashed it together with an interesting escape room design, resulting in a clever, seven minute search-a-thon. The ever-present antagonist, his unusual disposition and the specific player-related limitations that result were executed very well by the two actors present. In truth, I don’t really enjoy escape rooms. They’re too often convoluted, illogical exercises in frustration, but Twisted Nightmare was well done – appropriately challenging and, most importantly: FAIR. And lastly, we come to the Challenge Trail. This year, you and your group are tasked with piecing together a secret spell that will abolish a curse that has overcome the Estate, enacted by a coven of six foul(ish) witches. That’s all. To accomplish this lofty goal, your group must complete each witch’s challenge to learn her segment of the spell. Unlike previous years, teams succeed or fail as a unit, not individually, so teamwork is paramount. We enjoyed this alteration, preferring the exalted camaraderie of pulling together and defeating each witch over the “every man for himself” mantra from last year (Plenty more on this in special effects). Though it wasn’t really explained WHY we were completing several of the challenges, the entire story pulled together nicely at the end, resulting in a truly cathartic ultimate stand-off that actually did provide a legitimate sense of accomplishment. Mind you, the final step of the post-trail challenge (challenge seven, if you’d like), is a solitary affair, afforded to a group-chosen individual in possession of an excess of valor, vim, and healthy vocal chords. Right. Of course it was me. And it was AWESOME. Here’s the skinny – as I will describe more acutely below, HHE’s 2016 iteration is great… a lot of fun. However, it is not a particularly FRIGHTENING experience. Legends, the intended legitimate scarehouse of the bunch was good – a lot better than last year, but it wasn’t especially SCARY. Most of the interactions throughout this hotel were with “talky” actors and, entertaining as they may have been, there were very few moments that generated any sort of visceral reaction. Boo scares were kept to a minimum and several actors just seemed to be too busy reciting lines to actually try to jolt us. A lot of customers prefer mindless jump-scares and Legends really didn’t have a lot to offer in that department. Fortunately, prolonged bouts of menace were properly administered at regular intervals by the handful of very proficient scare-merchants on staff. Perhaps ironically, The Twisted Nightmare Escape Room was a good bit creepier (per capita). Though the path to the actual escape room is brief, the few actors within effectively escalated the sense of uncertain dread as we neared our destination. After receiving our goal and quietly slipping into the escape room-proper, we got to work quickly; with only seven minutes to achieve our goal, time certainly compounded our anxiety. Escape rooms are not usually intended to be outright scary, per se, but the circumstances of our imprisonment were actually quite clever. In the spirit of intentional vagueness, the mechanism of our escape was designed within a uniquely-claustrophobic medium, forcing even more mental strain unto we, unhappy prisoners, than a standard Escaper. The result? Seven psychologically-straining minutes of controlled anxious inertia. Quite well done. The Challenge Trail is a different sort of animal. The focus, even more so this year than last, is definitely on the challenges, the story line, and succeeding as a team. There are certainly a handful of fright attempts scattered about the trek, but the scare level has been significantly detuned from last year, with both the number of challenges and the length of the trail shortened. There could have been more free-roaming monsters or creepier environs, but what was present was executed well. 14/18/22 dollars for 1, 2 or all three attractions; 10 dollars more for the Estate Spirit Pass (fast pass). We spent at least two hours getting through all of the attractions, not including all of the wonderful interactions we had with actors BETWEEN attractions. Bang for your buck is off the charts here. We were (justifiably, I believe) pretty hard on HHE last season for lackluster showings in two of their three attractions and incredibly long, unjustifiable waiting lines. In truth, we were somewhat hesitant to review them again this season. It was a long drive, and we really didn’t want to risk a repeat disappointment. Hey, when I’m wrong, I’m wrong. Nearly every aspect of the Estate was better this year, with, as you may have guessed from this review, the quality of their actors being the most profound. It seems like they’ve really found their niche, embracing their strengths and dramatically improving the overall experience. HHE is not the most frightening haunted attraction around, and it doesn’t need to be. Above all else, the ultimate goal of any attraction should be to entertain their customers. Were we entertained when we visited the Estate this season? Absa-friggin’-lutely. Haunted Hills Estate is a must-visit attraction this season. Don’t miss it.